Slider photography courtesy of Evan Sung. 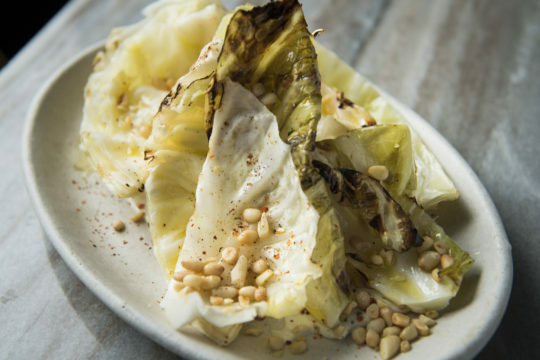 Adam Nadel is the executive chef of Casa Apicii, a seasonal Italian restaurant, located in the garden level of a historic 19th century Greenwich Village townhouse. I grew up in Agoura Hills, CA, a suburb of Los Angeles. I was raised in a close family that always ate dinner together at the table and used the kitchen as a central gathering space as much as a place to prepare food. Both of my parents are working professionals, but always found time to get the family in the same place for dinner. My mother was the family cook unless my grandfather was around. His influence left a lasting impression on me. He was always the figure in the kitchen during large family gatherings. It was while attending the University of Colorado that I really began to see myself cooking professionally. I subsequently enrolled at the California School of Culinary Arts. We first came to know you from Nobu 57 ~ but can you tell us about your career history and how you came to New York? I came to New York on a whim. I applied to what I thought were places I should work. I ended up at Nobu 57, which turned out to be a great starting point in my career. From there I went to open Nobu San Diego. Having spent nearly a year in San Diego I felt time to move on from Nobu, so returned to Los Angeles and worked for Michael Cimarusti at Providence. After a year and a half the need to return to New York hit me, so I drove across country and came back to the city. I initially began working at Tailor with Sam Mason until it closed. Soon after I received a call from Missy Robbins to help open A Voce Columbus, where I was Chef de Cuisine for four years. I then went to Lincoln Ristorante where I was chef de Cuisine under Jonathan Benno for nearly three years. I was approached about Casa Apicii as I was leaving Lincoln. Obviously you have a strong pasta pedigree, how did Missy Robbins and Jonathan Benno, shape your education. I think that I got a good handle at A Voce. It was unique in that there were no extruded pastas. We didn’t own an extruder. We did basically all egg-based dough, Emilia Romagna-style bases with slight variations on it. Everything was made in the house. Both restaurants have an army of people. I think that is where I grew a serious appreciation for it. You know, when you get to restaurants, you want to find what’s your thing, what your niche, what’s your specialty, what’s the thing that you would alway try to attain to be better and better at, for me it was pasta. So, I had a great foundation there and then going to Lincoln where I had something to learn about extrusions and have a different appreciation for things, other people’s perspectives to pasta, other diners’ perspectives of what they wanted. So, it’s something that was a great foundation to built on. Then coming here (to Casa Apicii) and kind of letting the rules lose a little bit. We do a lot of fun stuff here. Our pappardelle is a chestnut based pasta that has dried porcini in it. So, it really takes on this really cool sort of umami based flavor. Are you using chestnut flour? 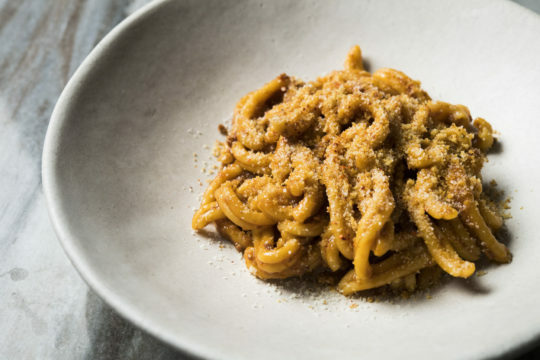 Our chestnut pasta, which is dried and ground chestnuts (chestnut flour), whole wheat flour, double zero Italian wheat flour and dried porcini. I use a lot of egg inside of my durum extrusions. I think that the egg protein really helps give it a good mouth feel. Traditionally, you’ll find extrusion pastas to be all durum white. Just by virtue that the place is where this stuff comes from. It makes more sense to sell the eggs than it does to use them themselves, and just trying to develop something that’s awesome. A rigatoni, or a strozzapreti, bucatini. All those have egg inside of it because it creates a little durability. Aside from more focus on extruded pasta going into Lincoln, is there another philosophy that you can really pinpoint? I think that the success of a restaurant means you have to be adaptable. 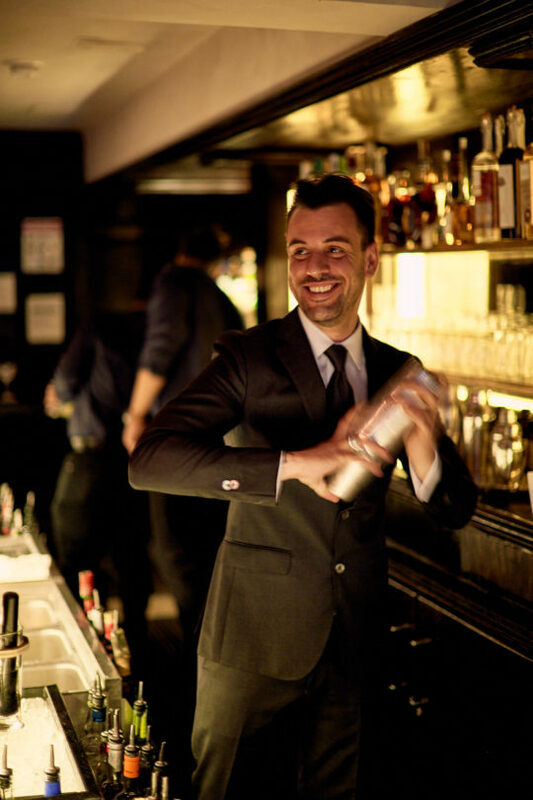 You have to be willing to make your guest happy, make yourself happy, make the restaurant successful. If you find ways to keep eliminating yourself from being able to do things, you’re never going to achieve that. How did you get from Japanese to Italian food? In Japan it’s often said that the two cuisines have a lot of similarities. What are your thoughts on that? 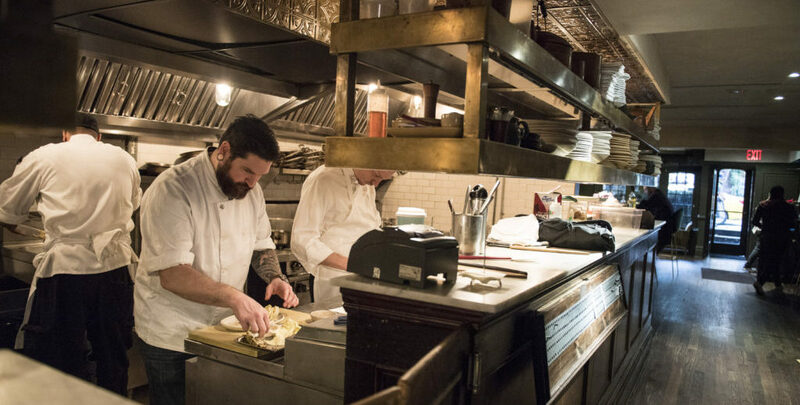 It took returning to New York to get a better understanding of Italian cuisine. My time at A Voce and Lincoln were invaluable, and from that I’ve been able to bridge the similarities between Italian and Japanese cuisines, i.e. starch preparations (pasta and noodles), vegetable-focused menus, regional dependency and the varying eating habits of differing social classes. Tell us about the food you’re cooking at Casa Apicii and how the project came together? 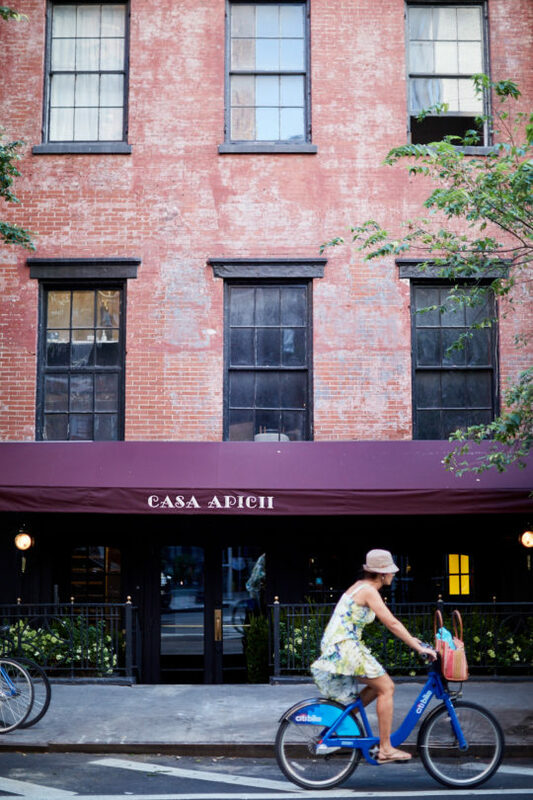 Casa Apicii revolves around the idea of accessible luxury and neighborhood hospitality. I met Casey Lane (chef of The Tasting Kitchen in Los Angeles) as he was planning to open Casa Apicii. Casey and I have very similar views on cuisine and our approach to Italian food philosophy. We wanted the menu to be interesting, inventive, approachable, local, hand crafted and representative of how Italian culture enjoys dining. How do you approach menu development? I use seasonality as the base for constructing the menu. We take ideas from regional research and apply locally grown ingredients. 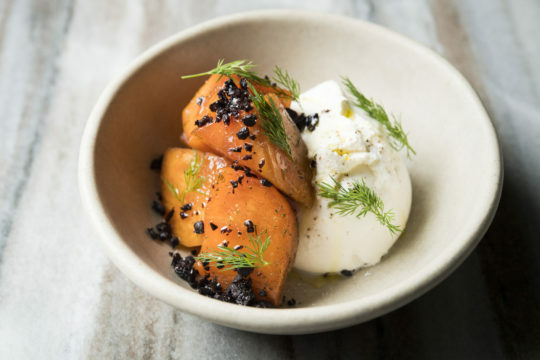 We recently had one dish on the menu, that paired persimmons with black olive and burrata. Can you tell us a bit about that dish? 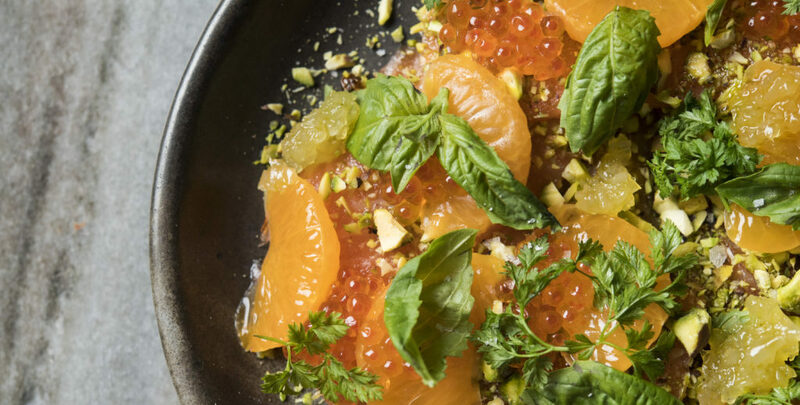 You know, you find cheese and fruit all the time we use – persimmons like a melon. I mean, like at the end of the day it eats like a melon and sort of has that taste like a melon. I think that’s kind of where it ultimately came from. To be honest I don’t know where the black olive came from, just kind of evolved that way. 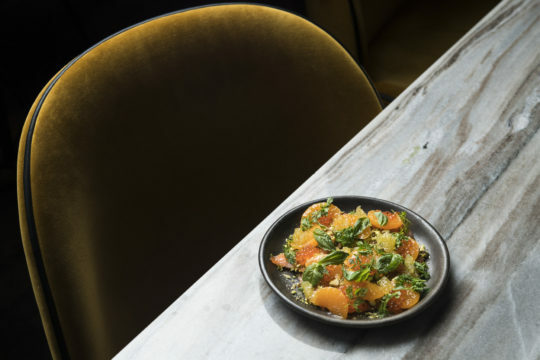 I think I was sitting downstairs one day trying to figure out what we’d do with persimmons and saw a big thing of dried dill and when eaten together, it turned out to be really good. I love dill. Maybe because my proclivity is northern Italian, I tend to find things like those northern flavors way more interesting. . 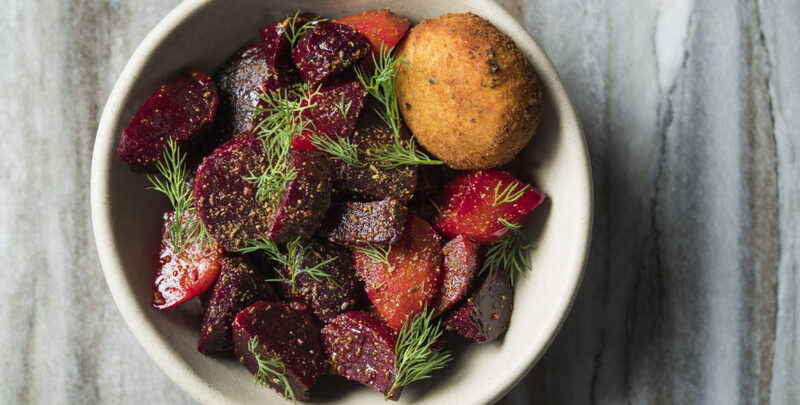 The Friulian use of cumin and caraway together, super fun and it kind of evokes this Austrian meets Mexican flavor. For me cumin means Mexican food to me. It’s like when you grew up in LA and you’re used to eating street food you get the flavor of cumin as very reminiscent of tacos for me. Again, you know it’s mostly what you can find, mixing, and matching the same ingredient depending on your application to make it Mexican or Italian or Hungarian. Can you share some of your can’t live without kitchen tools? Are there specific ingredients you are excited about right now? What do you like to eat or cook at home when you’re not working? My wife and I try to keep a vegetarian diet outside of work. 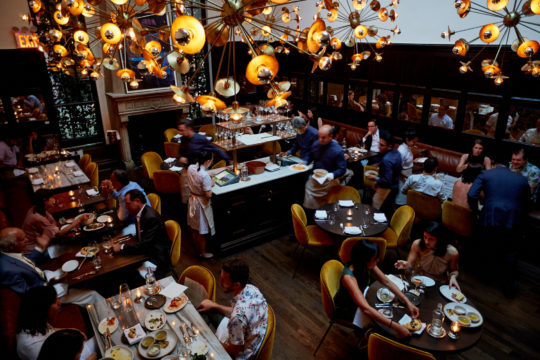 When dining out we visit restaurants similar to where we work for inspiration and points of reference.